Jen was a Shoelace. Julia was a Koala. The theatre department at Wayne State University has a long-standing relationship with the School at the Moscow Art Theatre (MXAT). Each summer for the last thirteen, Wayne State has sent a group of students to study with master teachers at the MXAT for the entire month of June. Our time is split between studies in ballet, Russian movement, Russian cinema, Russian theatre history, singing, stage combat, and, the subject that takes up the bulk of our class time, acting. 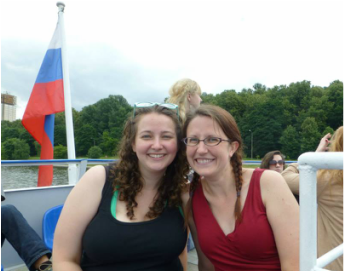 In the summer of 2013, Jen and Julia embarked on this journey together. The Russian approach to actor training is centered on ensemble, concentration, and imagination. So every afternoon, we assemble for a set of exercises aimed at developing the first two elements in that collection. But the second half of each class is devoted to the third element: imagination. In these sessions, we present an event in the life of our characters, be they objects, animals, or people. These small studies in detail and story and communication known as etudes seem simple at first, but each rehearsal, revision, and recitation reminds us of the skill and commitment required to grow as a performer. Nothing is ever perfect. Nothing is ever finished. But the reward comes in pushing ourselves to risk, to try, to exceed, to grow. The spirit of these classrooms full of imagination, exploration, rigor, and risk – this was the spirit that led us to create Etudes. Etudes is designed to be a space where emerging scholars like ourselves can stretch, explore, and take risks. The publication process can seem entrenched in pre-approved style and content, leaving the young scholar feeling disheartened and compacted into a rigid mold that may not comfortably fit. Performers know that the individual voice can be the most vital component of an ensemble, so why should scholarly writing in performance overlook that voice? We believe that rigor does not mean rigid, that scholarship need not be stodgy, and that a playful, performative voice can serve the performance subject as well as, if not better than, the formal. This inaugural issue of Etudes brings a variety of interests and voices together – from the practical to the theoretical; the textual to the scenic; the personal to the universal. The impulses to make and understand theatre displayed by these articles are expressions of the spirit we felt in that fifth-floor studio on Kamergersky Lane in Moscow one sweaty June.